Hi, welcome to Halifax Contra Dances’ website. We are a volunteer-run community group that organizes monthly folks dances to awesome live music on the Halifax peninsula, from September through May each year. Our non-gendered dances are welcoming to beginners and experienced dancers alike. No need to come with a dance partner. Our goal is that everyone has fun, and enjoys the movement, music, and sense of community that contra creates. We have limited resources to devote to this website – it may be out-of-date when you visit. Check out our facebook page at www.facebook.com/halifaxcontradances for the most current info. You can sign up for our e-news list here, to get notifications for each dance – and you can contact us any time with questions or for more up-to-date information at info@halifaxcontra.ca. We also occasionally hold dances in Wolfville – contact us for updates. All dances are held at All Nations church, 2535 Robie St, unless otherwise noted. 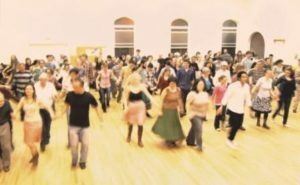 Beginner session is at 7:30, dancing goes 8:00-10:30 pm. Dancing difficulty increases after 8:30 pm so beginners should come early. More details about our dances (including what to bring and what to wear) can be found here.